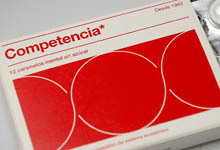 The Spanish Competition Authority (“CNC”) has entered the “pharma” business by launching a new product: “Competition pills”. Competition “alleviates the symptoms derived from the congestion of the economic system, by eliminating monopolies and barriers to entry“. “Especially recommended for cases of economic limpness and ciclical crisis“. “Thanks to its formula and active principles, Competition produces beneficial effects on the consumer under the form of inferior prices or greater abundance, variety and quality of products, with the ensuing improvement the welfare of society’s organism“. The leaflets included inside the “medicine package” also explain what the functions of the CNC are and what it its that the institution does in practice for the protection of competition. They advise to “maintain the product at the reach and sight of public administrations, public organisms, private companies and consumers”. They also warn about the possible side-effects of Competition: “it is foreseeable that it may cause reactions on the part of pressure groups and lobbies”, for those cases, the CNC recommends to “increase the dosis of Competition“. 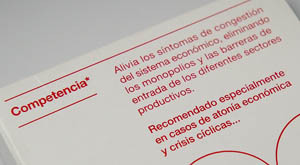 In sum, the leaflet emphasize that “without Competition, the health of the economic system is at risk“. Interestingly, the CNC’s [looking for the right adjective…….] “original” initiative is aimed at increasing its visibility and intends to make known the importance of its functions precisely at a time where a draft new law that could radically change the institutional model is in the pipeline. Still I’d be curious to know who’s the psychedelic case handler at the CNC who came up with the idea.